Emmanuel Boys’ Choir has been based at Emmanuel Parish Church, Wylde Green since 1999. Its foundation goes back to 1976 when first established by the present conductor. This Choir has produced six recordings, sung in most major English Cathedrals, sung abroad in America, Germany, France, and the Netherlands. The Choir was the first Church Choir to sing at the new Symphony Hall. They sang in the presence of HRH Princess Anne at the National Exhibition Centre, and have performed several times on national radio. Their last tour was to France in 2015 where highly acclaimed performances of Handel's Messiah brought packed audiences, standing ovations and encores! Emmanuel Girls' Choir was set up in 1996 and the Choir now exists alongside Emmanuel Choir. Girls aged eight upwards form this choir and they sing three Sunday morning services every month as well as additional weekday services. 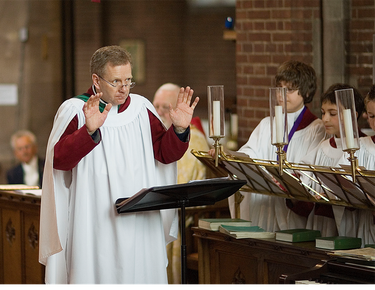 The two choirs perform together at Christmas time for such occasions as Midnight Mass, the Candlelit Carol Concerts, and the Festival of Nine Lessons and Carols. The Girls' Choir join the Choir of Boys and Men to perform concerts and services both at home and abroad, including recent trips to York Minster, Birmingham Cathedral and Notre Dame de Paris. Richard Mason is the Director of Music at Emmanuel. He is native of Sutton Coldfield, a pupil of Bishop Vesey’s, and subsequently studied at St. Peter’s College, Saltley, and the University of Warwick. He taught for eight years in the Metropolitan Borough of Solihull before taking up the post of Head of Music at Aldridge School, in 1983, where he directs a specialist music course for able young musicians. He was the Organist and Choirmaster at St. Columba’s Church from 1976 a post he held for some twenty-three years. During his time there the Choir developed a fine reputation, travelled abroad extensively, made six recordings, sang in most of the major English Cathedrals, and performed in such venues as Symphony Hall, Royal Albert Hall, and the NEC. In 1994 he was awarded the Medal of Achievement by the Aachen Chapter of the Europa-Union in recognition of his work with visiting Europe with choirs and school orchestras as well as welcoming so many German musicians to Sutton Coldfield. He conducts Sutton Coldfield Choral Society and has undertaken occasional work for the Royal School of Church Music in the form of conducting local choir festivals and examining choristers. Emmanuel happened to be the first Church at which he played the organ for a service sometime in the 1970’s! Richard is a Liveryman of the Worshipful Company of Musicians.